Now that you have chosen the natural menopause path, be it self-help or a guided approach, you still may fall into old habits that can impede your process along the way. But don’t worry, this is normal - think of the process as creating new habits to replace old ones which will help future-proof your health for the years to come. Over the years I have heard from a substantial number of women before starting my programme that they have tried everything and nothing ever works. In most cases, they have tried a supplement or made a dietary change for a month or less and expecting some incredible results. I can guarantee if you do not give yourself adequate time or if you cherry pick (in most cases tweaking your diet or taking a random supplement), you will never achieve the results you so desperately want. If you had, you wouldn’t be reading this post. To reclaim your wellbeing and future-proof your health, you must be willing to embrace all aspects of what science shows works. And I promise you, once you get there you will never want to go back. If you have read any of my past blogs or articles at the Daily Mail, Huffington Post, Chilled Menopause, We Are The City, and so forth, one component I always write about is getting your nutrients in optimum range. But what does that really mean and why is that important? As we age we lose many of the nutrients due to stress, lifestyle, eating habits, diet or loss of hormones. This will not magically rectify itself once we get past the menopause. In fact, it is only going to get worse unless you learn to refuel. So first before going any further, you must decide if your really want to feel better and live a long health-filled life. If you eat junk, you are going to feel like rubbish. There are no two ways around this fact. That’s why it’s so important to eat a nutrient-rich diet. You don’t need to exist on rabbit food! A nutrient rich diet is not just leafy greens, carrots and tomatoes. It is so much more. You can choose from a variety of nuts such as almonds, cashews, walnuts, pecans, hazelnuts and peanuts and nut butters just to name a few. Sprinkle them on salads, in cooked vegetable and stir fries to add a bit of rich nuttiness to the dish. Avocado is the perfect healthy fat that you can smear, spread or dip. Eggs, lean meat, poultry and fish help you feel full and give you brain power and energy to sustain you throughout the day. Stay hydrated with water or calorie free drinks to keep you refreshed and on top of your game. Also breaking your meals down into smaller portions and recording what you eat will help you stay on track. If you do think you may have some deficiencies, download our nutrition assessment and see where you are nutritionally as a starting point. Take out any foods or beverages that will impede your body from the absorption of good nutrients. I like to use the example of wine. Did you know the tannin in red wine can lock onto nutrients and stop them from being bioavailable to you. So when you drink red wine with a nutritious meal, the nutrients lock on the tannin and are not available to your body and your nutrient levels remain low. Mother Nature has given us foods and drinks that contain natural occurring oestrogens. What are natural occurring oestrogens? Foods where the cellular structure is similar to our own oestrogen. This allows our brains to be fooled into thinking that we have normal circulating oestrogen again. I discuss more about natural occurring oestrogens in my virtual menopause class in addition to explaining what is happening in your body during this stage of life. Choosing the correct supplement is an important decision to your road to recovery. There are literally millions of supplements littering the market today, some promising this and others promising that. First and most importantly, only use supplements that are standardised and science based with properly conducted clinical trials. All the supplements I recommend are based on medical research which I consider very important. In most cases one supplement will NOT do a magic trick when first starting a programme. You will need a combination of at least two or more to jumpstart the process. Not everyone will benefit from the same combination of supplements. I like to recommend to everyone Fema 45+ UK or Gynovite (US) and Promensil (which contains red clover - natural occurring oestrogens) to start. All of the products I use in my programmes have been shown to be safe and effective in clinical trials. If you would like to learn more about the products I recommend, visit my shop at maryonstewart.com/shop. Each product contains an explanation on why I have chosen to use that supplement. Exercise is great for anyone at any age. But for women during menopause it is a true life changer. Exercise speeds up your metabolism so you look slimmer and have more energy. It gets you in shape while strengthening and even oxygenates your brain so you can think more clearly and rationally. People who exercise also tend to enjoy an elevated mood due to the endorphin rush in their bodies. Relaxation has so many benefits such as slowing your heart rate, lowering blood pressure, improving your digestion, maintaining normal blood sugar levels, reduces stress hormones, increases blood flow, and reduces muscle tension therefore reducing chronic pain. But did you know that relaxation can reduce your hot flushes too? In some cases up to 60 percent. Before you say you have tried everything, think again. My programme has had over 90 percent success rate with women who have followed it for five months. But you can’t choose to do some things and not others. It is a cohesive programme where every piece has equal weight to the others. Even women who attend my 6 Week Boot Camp have experienced significant change in only six short weeks. So you do not need to suffer any longer. There are viable solutions for you to help you get your symptoms under control and allow you to transition into your next phase of life. Plus these changes will not only make you feel better, but you will be future-proofing your wellbeing. You have several options available to you. Sign up for our weekly Hot Flash newsletter. Join my menopause virtual class to learn more about what’s going on in your body. You will get answers to your questions. Sign up for our managed self-help programme - the 14 Day Menopause Empowerment Programme. Register to attend our guided instruction programme with weekly Live Sessions with Maryon - 6 Week Cruising Through The Menopause Boot Camp. I look forward to meeting you and hope we can journey together so we can help get you feeling back better than you did before. 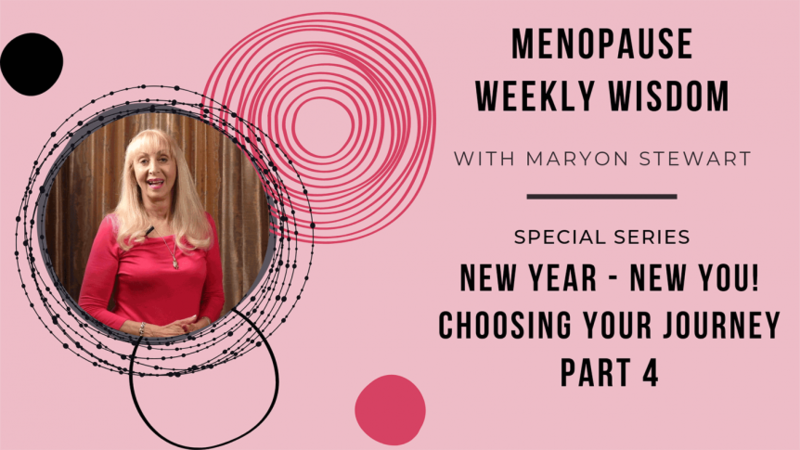 Watch Part 4 of this month's series "New Year, New You Choosing Your Journey Through Menopause"